Venture deep into the virtual rainforest in Jungle Wild, a 5 reel, 30 payline video slot from WMS. The highlight of this ancient Mayan adventure is the bonus feature which awards between up to 40 free spins. Start your tropical trek from between 30p and £90 per spin. The imagery in Jungle Wild has a strong rainforest theme – set against a dense jungle backdrop, the reels include an assortment of plants and flowers, butterflies, parrots and monkeys. They’re joined by a pair of gold burial masks, both of which award 750 times your line bet if you manage to land 5 on a line. There’s also a wild, the Jungle Wild logo, which replaces all other symbols apart from the scatter – 5 of these in a line pays 2,500x. The ancient temple is the game’s scatter and the key to unlocking the game’s main feature. Land 3 temple scatters and you’ll receive 5 free spins. 4 scatters and the tally increases to 7 free spins. Land a full 5 for the maximum allocation of 20 free spins. On each of your free spins, 2 wilds will turn totally wild, greatly improving your chances of creating a decent winning combination. The free spins come with a guaranteed payout of at least 10 times your stake – that’s assuming you’re playing the full 30 paylines. If paying less, your free spins will benefit from a 2, 5 or 10x kicker. You can trigger more free spins by landing 3 or more scatters during the feature giving you up to 40 potentially. 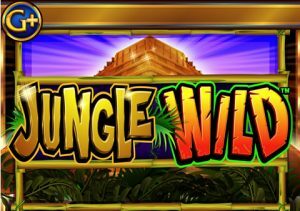 Jungle Wild is pretty simple fare both in terms of looks and playability – the graphics are a little blocky and aren’t as impressive as what’s on offer in the latest 3D, HD created video slots. It has a certain rough charm though. Likewise, the features which are fairly basic but do the job just fine. Jungle Wild is all about the Free Spins feature where the stacked wilds can really move things along quickly. Expect lean spells in between though. This is a fairly volatile slot though. If you’re after some simple, tropical adventure that still packs a decent payout punch, then Jungle Wild is worth investigating. If you like the theme, there’s plenty to choose from with Microgaming’s Jungle Jim El Dorado highly recommended.